Brooklyn residents, workers, and business owners still have a couple of few chances to be part of the bike share planning process, with two three workshops planned for March. This Tuesday, March 6th, sessions will be held at 6:00 and 7:00 PM at CUNY Medgar Evers College at 1650 Bedford Avenue to plan bike share station locations within Community Boards 8 and 9. The second is a workshop for the area covered by Community Board 6 and will take place on Thursday, March 15 with sessions beginning at 6:30 PM and 7:30 PM. It’s at the Old First Reformed Church, 729 Carroll Street, on the corner of 7th Avenue. I’m looking forward to attending this one, since it’s in my backyard. Update: The third is scheduled for Thursday, March 22 at 6 and 7 PM at the Swinging 60s Senior Center, 211 Ainslie Street for everyone in Community Board 1. 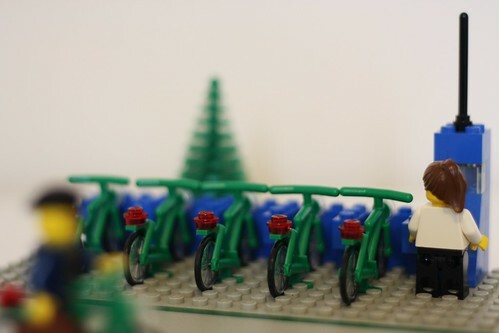 Please check out more of my Lego bike share geek-out photos Flickr. I have no idea what the New York system’s bikes and docking stations will look like; I simply chose the colors I used because I’m a fan of Minnesota’s Nice Ride I had a lot of green bicycles. By the way, Lego bike share stations have a lot in common with real bike share stations: they’re completely modular, have a pleasing symmetry, don’t need to be connected to a city’s electrical grid to work, and can be put into place in a very short amount of time. Make that three for March. Brooklyn CB1’s workshop will be March 22 at the Swinging 60s Senior Center, 211 Ainslie Street (sessions at 6:00 and 7:00).